In our recent effort to collect catalogues of shortest solutions for standard programming exercises, here is PPCG's first ever vanilla FizzBuzz challenge. If you wish to see other catalogue challenges, there is "Hello World!" and "Is this number a prime?". Write a program that prints the decimal numbers from 1 to 100 inclusive. But for multiples of three print “Fizz” instead of the number and for the multiples of five print “Buzz”. For numbers which are multiples of both three and five print “FizzBuzz”. The only exception to this rule is constant output of your language's interpreter that cannot be suppressed, such as a greeting, ANSI color codes or indentation. This is not about finding the language with the shortest approach for playing FizzBuzz, this is about finding the shortest approach in every language. Therefore, no answer will be marked as accepted. Submissions are scored in bytes in an appropriate preexisting encoding, usually (but not necessarily) UTF-8. Some languages, like Folders, are a bit tricky to score--if in doubt, please ask on Meta. Nothing can be printed to STDERR. Unlike our usual rules, feel free to use a language (or language version) even if it's newer than this challenge. If anyone wants to abuse this by creating a language where the empty program generates FizzBuzz output, then congrats for paving the way for a very boring answer. If your language of choice is a trivial variant of another (potentially more popular) language which already has an answer (think BASIC or SQL dialects, Unix shells or trivial Brainfuck derivatives like Alphuck and ??? ), consider adding a note to the existing answer that the same or a very similar solution is also the shortest in the other language. Because the output is fixed, you may hardcode the output (but this may not be the shortest option). You may use preexisting solutions, as long as you credit the original author of the program. Standard loopholes are otherwise disallowed. As a side note, please don't downvote boring (but valid) answers in languages where there is not much to golf; these are still useful to this question as it tries to compile a catalogue as complete as possible. However, do primarily upvote answers in languages where the authors actually had to put effort into golfing the code. Valid for v5.5 onwards. The õ is character 245, a bit inverted \n. I assume the default interpreter settings, as they are without any ini. If you are uncertain, you may disable your local ini with -n as in php -n fizzbuzz.php. Diagram created with Timwi's HexagonyColorer. Finally got around to finishing this. I had written an ungolfed solution weeks ago, but wasn't entirely happy with it so I never actually golfed it. After revisiting it the other day, I found a way to simplify the ungolfed solution slightly, and while I think there might still be a better way to approach the problem in general, I decided to golf it this time. The current solution is far from optimal, and I think it should actually fit in side-length 6 instead of 7. I'll give this a go over the next days, and when I'm happy with the result will add a full explanation. First try at golfing, I think this is as bad as it gets (both language and golfing). The shortest approach I've found yet. Perhaps there's a better one; suggestions are welcome. This was originally flagged ES6, but this works in ES5, and to my knowledge there's not a shorter way with ES6 features. Make China, China minus America;! Make Democrats, Democrats minus Trump;! Make Obama, Obama minus Putin;! Otherwise do this: tell Hillary all her lies!!! Hillary is, as always Hillary plus nothing;! I was quite bored... Not too efficient, but fun! 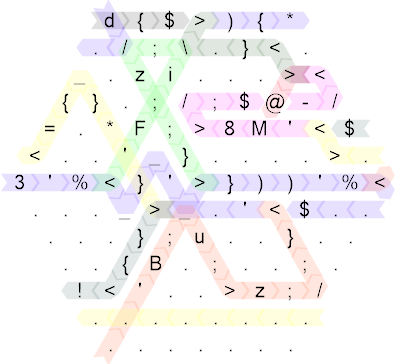 On vimgolf.com we have the classic Remember FizzBuzz?, which is similar to this, but keeps the numbers on all the lines. There's also Neither Fizz nor Buzz, which uses a similar format, but provides a useful input file. Those small differences drastically change the optimal solution. I did exactly this same variation 2 years ago in the edit to this reddit post. I had to check whether visual increment (not available back then) creates an improvement, like it has for the other variations, but it looks like it hasn't. 33o<CR>Fizz<CR><Esc>: Create the Fizz lines AND the blank lines with a simple insert mode repeat. Much quicker than a macro. AFAIK first discovered by @KersonHsiao in the vimgolf.com version, and used by every top solution since. qqABuzz<Esc>5kq19@q: A very simple macro appends the Buzzes. :%s/^$/\=line('. ')<CR>: Replaces all blank lines with that line's line number. The expression replacement is very long, so this tactic is rarely used in vimgolf, but the alternatives are all worse. So I know that the integer must be printed only when we did not print a fresh-line. But if I print the integer, I must also print a newline after it. That's why there is a DO. DO is a basic yet almighty looping construct that iterates until a condition is met. Here, the condition is the return value of (fresh-line). It it tested before each iteration of the body of the loop, notably the first one. So if the test returns T, then we exit the DO. Otherwise, we execute the body, which prints the integer. Then, we execute the test once again and this time, it returns T because current line is "dirty" (there is an integer printed now). How does it work, you ask? ... I have no idea. I might edit in a full explanation at some point if I ever decide to try to understand this again. I do not think that this could be golfed any further. Thanks to branislav for helping me golf this. Cell indexes in comments are in hexadecimal to match numbering in bfdev debug view. Almost as short as Java. This is just the trivial answer generated by another program, This is still a computer generated answer, but I am sure there are way shorter solutions! The general idea is initializing the cells to 4 B F i u z. If the program has to output a number, it just goes to the first cell and manipualtes it, if it is one of the letters, it will just jump to the corresponding cell and output it. 1  Push a one to the stack. ^? Spooky invisible unprintable that pushes 100 to the stack. 2  Pushes a two to the stack. 3%      Takes mod 3 of the top number on the stack.
! "Fizz" If falsy, push "Fizz". ~       Push the contents of the register.
! "Buzz" If falsy, push "Buzz". ?~      If truthy, push the contents of the register. }\ For loop between 2 and 100, pushing the counter to the register and stack each time. Lò1       // Create the inclusive array [1...100]. Xv5)    //   if X is divisible by 5, 1 time, otherwise, 0 times. ||X      //  If the result is an empty string, set it to X.
} qR      // Join the range with newlines. Lo            // Create the range [0..100). X%5?4:8     //   if X is divisible by 5, 8; else, 4). ||X          //  If the result is an empty string, set it to X.
} qR          // Join the range with newlines. 1o#e          // Create an array of 1 to 100. (X%5? ":Buzz" //  if X is divisible by 5, "Buzz"; else, an empty string. It's shorter than other CL solution and it uses different method. Conditions are handled inside format function. # Counters start at 0. So $a will be increased to 1 on the first iteration. # On subsequent iterations, it counts up by 1 each time. # operator. So you'll be seeing that every time there's an if statement. # It's pretty helpful for a fizzbuzz! # "if" statements since the preceding "else", so sometimes a dummy "else"
# resort to that for our FizzBuzz program, though. # Now we've printed Fizz/Buzz/FizzBuzz/the number, print a newline. # BuzzFizz, but a comment counts as a statement). # back to the start of the program. In addition to the commands seen in the FizzBuzz program above, BuzzFizz also supports input (if you use an identifier like a with no leading $, the program will ask for its value; you can use a statement like clear a to reset the value so that the program asks for it again the next time it's used). Other than that, the above program shows off all the features of the language; in other words, we have a complete language built entirely out of the operations you need to write a simple FizzBuzz program (thus the name). That said, the language is (intentionally) not Turing-complete; the original inspiration of the language was to act as a counterexample to people who made claims of the form "any language that can do X must be Turing-complete", as the most common choices of X don't actually require it. On the other hand, it's also (intentionally) very powerful for a sub-Turing language; it's fairly hard to come up with simple problems that BuzzFizz can't solve and Turing-complete languages can. I'm sure this could be golfed, but I think this is a good start. Try it in this online interpreter. Tries to combine the printing of Fizz and Buzz. Ends up at 88 bytes. Forgot about newlines. 122 bytes. Ick. Without newlines it would be 122-41=81 bytes. Welp. Undeclared variables are zero by default, so i=0 can be omitted. The three line breaks are required. I'm kinda new to Haskell, so any advice would be appreciated! Not as graceful as the golf languages. I could save bytes using print instead of write, but print indents 1 space without a format specifier which would increase the byte count instead. Likewise I lose bytes printing the number because Fortran doesn't like left-justified output for numbers. I didn't bother sticking it all on one line as newlines and semicolons are both 1 byte -- no savings. Not the answer you're looking for? Browse other questions tagged code-golf string kolmogorov-complexity arithmetic or ask your own question.